For these cookies you will need a onesie cookie cutter (or a romper or bodysuit or whatever you call it) I used the onesie cutter from the Wilton Baby Cookie Cutter set which is available at all the big craft stores. This is a good set to have because both the onesie and the sitting bear are on my list of favorite cookie cutters. 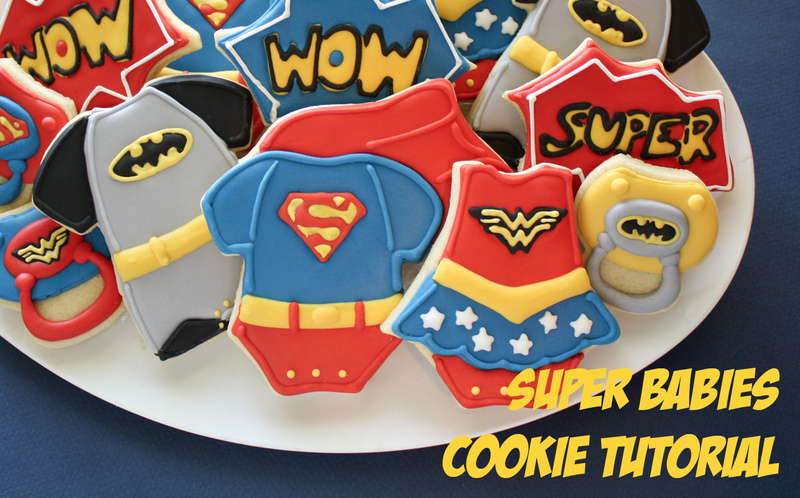 You could certainly make these cookies by just decorating the onesie as it is but it's pretty easy to add a few cute pieces for a little Superhero flair! I used a flag cookie cutter to cut the blowing cape for Baby Superman. To attach the cape, first cut both the flag and the onesie individually. Then use the onesie cutter to cut the flag. Transfer the onesie to the cookie sheet and then attach the cape. Once the cookies are baked and cooled the seam should be strong enough and won't break with normal handling. Try to move the cookies as little as possible though until they have cooled. 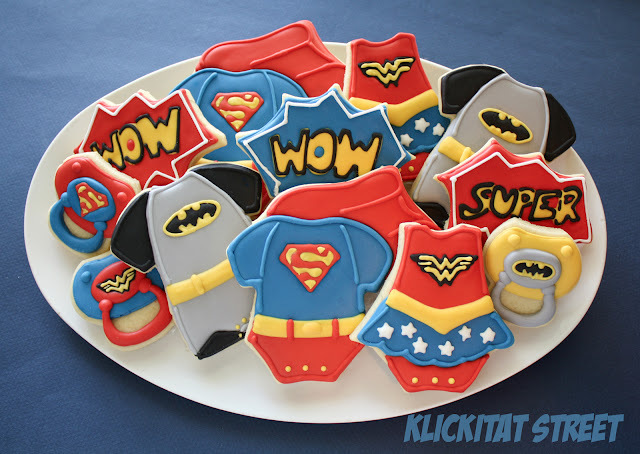 You can also use a bat or bell cookie cutter to add a cape around the onesie like I did for these Baby Batman and Robin cookies. To make a girl's dress for Baby Wonder Woman first cut the onesie shape. Then use a large slightly curved shape like a pumpkin or an oval to cut the sleeve off and cut the skirt in one clean line. If you'd like to leave the sleeve attached then I would suggest using a Christmas tree cutter for the skirt. 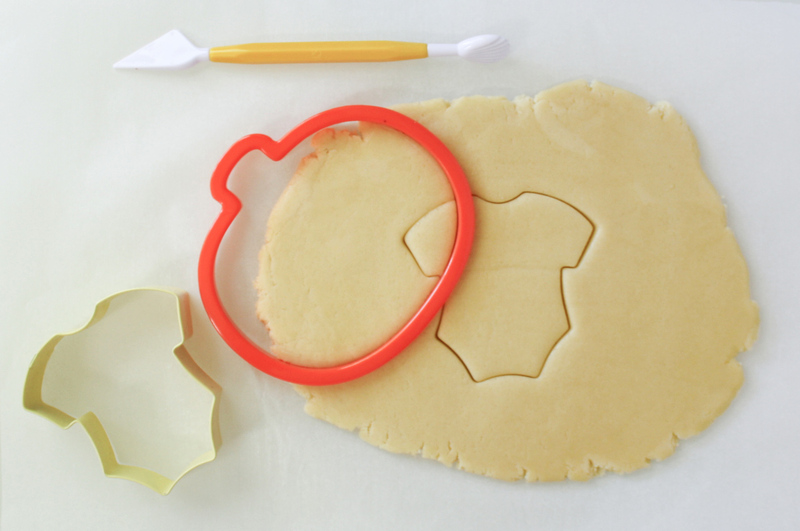 Use a knife or the large round to cut under the skirt and then transfer the pieces to your cookie sheet. For Batman I added some little short pants. 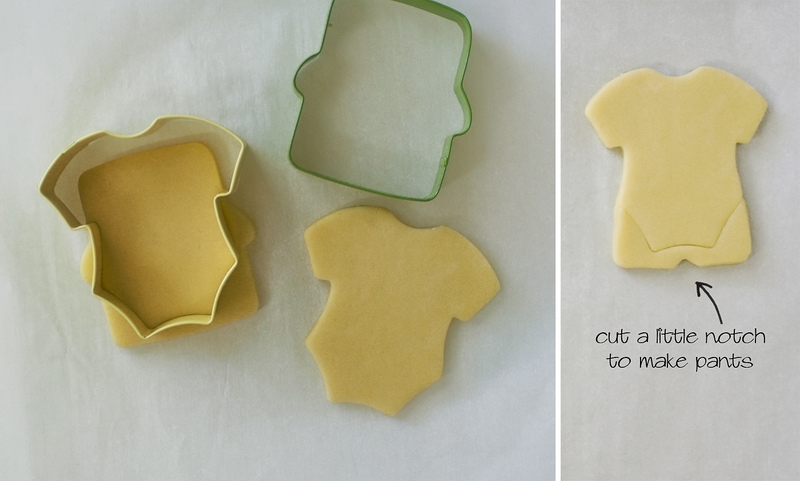 You can use any squarish shape that is the same size as the onesie cutter. After you've transferred the shapes to the cookie sheet cut a little notch to make the pants. 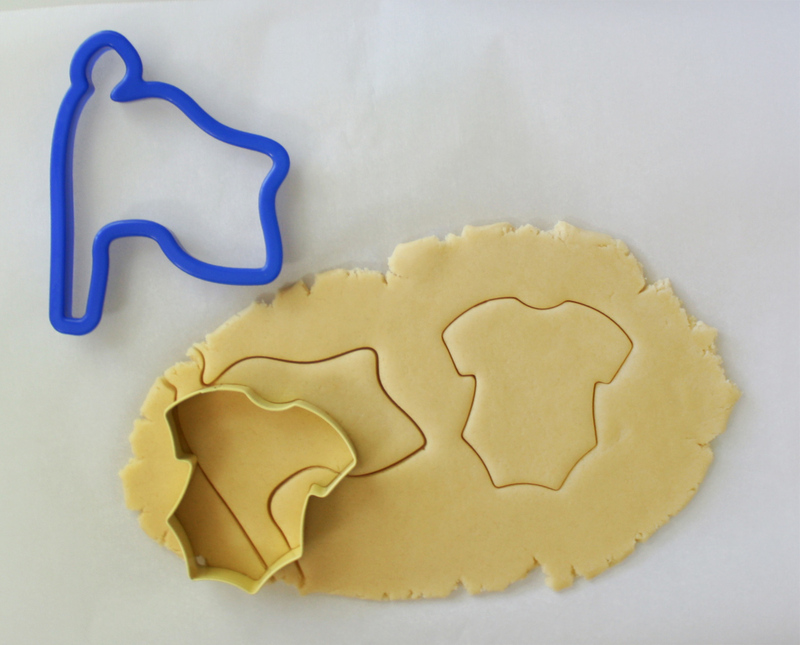 To decorate the baked cookies start by outlining the shapes in royal icing. You'll notice I filled in the bottom of Batman's pants right away. In smaller areas like this filling the shape while the outline is still wet can help to prevent those pesky craters. Let the outline dry for several minutes and then fill alternating sections. I used royal icing transfers to make the emblems super easy. 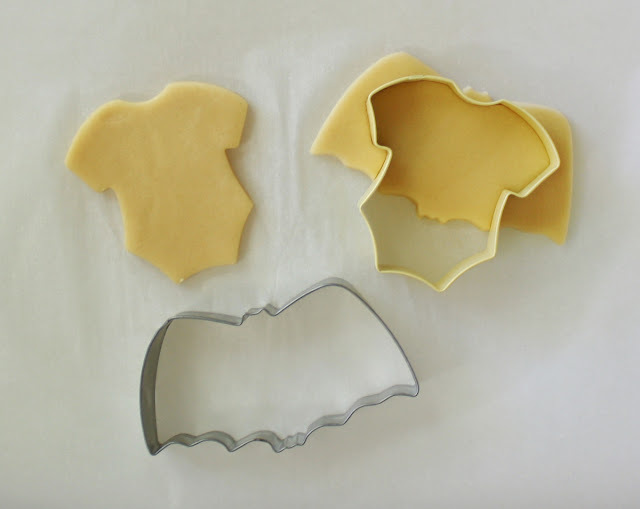 (visit this post for more information about transfers) Use tweezers to gently place the dry transfer in the wet icing. Give the icing a couple hours to dry and then fill the remaining sections. Let the cookies dry for several more hours or overnight. Finish off with a few quick piping details and you're done! 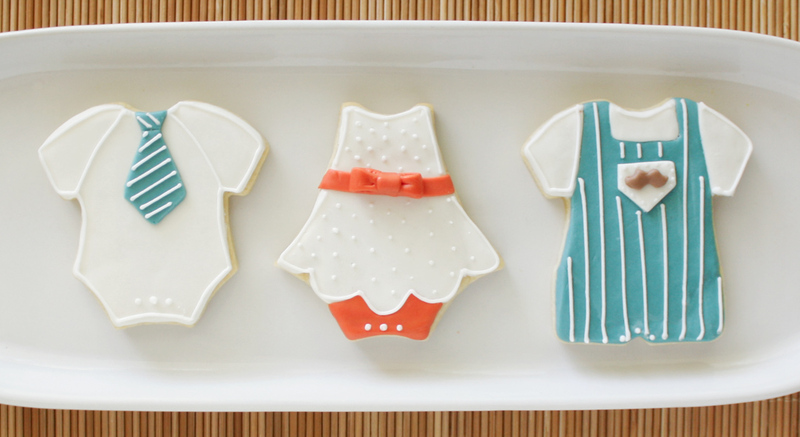 Don't forget to include the diaper snaps so that the cookies look like baby clothes. Of course, every Super Baby needs an alter-ego so you can always use these shapes with everyday colors! See what did I tell you? Cute and Easy! You absolutely make me smile. You amaze and inspire me! How lovely! And so creative! Thanks for sharing! OMG...these are adorable! That was a lot of "piecing" together, not sure how you figured all that out! LOVE the pacifiers too!! You are so smart!! I love the flag as the cape! LOVE THESE!! Oh my gosh!! Pure cuteness here!!! Thank you for posting this. 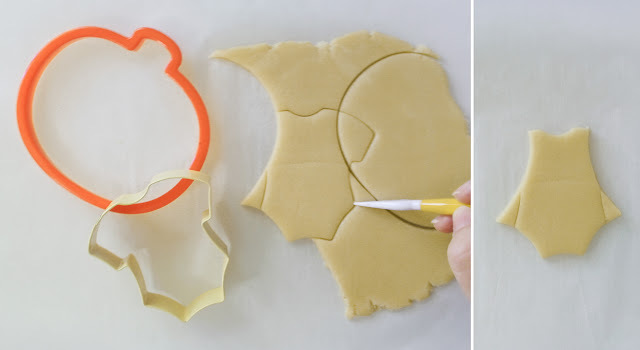 I always wondered how you do separate cookie cutters and make one special cookie!! Seeing is to believing.....hehehhe!!! All of these designs are adorable, thanks for the tutorial. Sarah, I came for the cookies but stayed for the art! You are amazing! Saludos desde este hermoso país llamado Chile. This set is incredible!!! I love them all! The pacifiers are so perfectly done too!! Very cute and very creative! Brilliant! SO creative and cute!!! These cookies are adorable. It would be great if you could make these cookie cutters for us and sell in your Etsy shop. Thanks. what did you used for the pacifier? I wondered that myself. My best guess is that it is a small skull cutter. Hth! The pacifiers were made from the body of a snowman. Any cutter with two bumps like that would work though if you just trim the rest away. I decorate cakes, but have never decorated cookies. Did you outline in royal icing then fill using color flow? How hard would these be for someone who has never decorated cookies? You did a great job on them! They're so cute.